Grumman F6F-3 Hellcats on 1943-01-21. F6F-5 ready in catapult on USS Randolph. Grumman F6F-3 Hellcat on the flight deck of USS Yorktown (CV-10) prior to take off, having its wings extended. 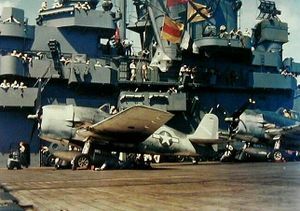 Grumman F6F-3 Hellcats in tricolor scheme on the flight deck. The American Grumman F6F Hellcat fighter from the same stable of the Grumman "Iron Works," shared a heritage with the earlier F4F Wildcat, but was a completely new design sharing only a familial resemblance to the Wildcat. Some wags tagged it as "Wildcat's big brother" . 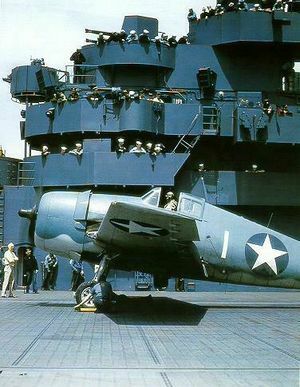 The Hellcat and the Vought F4U Corsair were the primary United States Navy carrier fighters in the second half of World War II. The Hellcat proved to be the most successful aircraft in naval history, destroying 5,163 aircraft in service with the US Navy and US Marine Corps, plus 52 with the Royal Navy's Fleet Air Arm during World War II. After the end of World War II, the Hellcat aircraft was rapidly phased out of frontline service, finally retiring in 1954 as a night-fighter in composite squadrons. Well before the attack on Pearl Harbor and the F4F Wildcats engaged the more maneuverable and better climbing Japanese A6M Zero in combat in the South Pacific, Grumman was working on a successor to the Wildcat that could take on the Zero. The contract for the prototype XF6F-1 was signed on 30 June 1941. The F6F was originally to be given the Wright R-2600 Cyclone engine of 1,700 hp (1,268 kW), but based on combat experience of F4F Wildcat and Zero encounters, Grumman decided to further improve their new fighter to overcome the Mitsubishi Zero's dominance in the Pacific theater. Grumman installed the Pratt & Whitney R-2800 Double Wasp 2,000 hp (1,500 kW) estimating a 25% increase in performance would result. The first, Cyclone-equipped prototype (02981) flew on 26 June 1942 while the first Double Wasp-equipped aircraft, the XF6F-3 (02982) had its first flight on 30 July 1942. Proposed at the same time as the first Hellcat prototypes, the XF6F-2 incorporated a turbo-supercharger but performance gains were only slight and until fleet demands for improvements in speed, this variant, along with the two-speed supercharger-equipped X6F-3, languished. However, later F6F-4 and F6F-5 variants did benefit from these initial development programs. 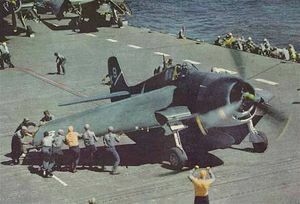 The first production aircraft off the line, designated F6F-3s, flew on 3 October 1942 with the type reaching operational readiness with VF-9 on USS Essex in February 1943. 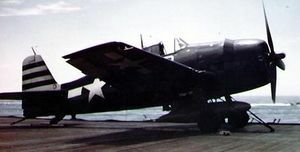 Standard armament on the F6F consisted of six .50 caliber (12.7 mm) Browning machine guns with 400 rounds each; later aircraft gained three hardpoints to carry a total load in excess of 2,000 lb. (900 kg) bombs. The center hardpoint also had the ability to carry a single 150 U.S. gallon (568 L) disposable drop tank. Six 5 in. (127 mm) HVARs (High Velocity Aircraft Rocket) could be carried; three under each wing. The next and most common variant, the F6F-5, featured improvements such as all-metal control surfaces, replacement of rear windows with armor, improved visibility through the windshield, and numerous other minor advances. Another improvement in the F6F-5 was the availability of more potent armament than the standard six .50 caliber (12.7 mm) machine guns. Trials with cannon-armed Hellcats were not followed up by a production version, although the armament mix of a pair of Hispano 20 mm (0.79 in.) cannon carrying a minimum effective load of 220 rounds each, along with two pairs of .50 caliber (12.7 mm) machine guns; each armed with 400 rounds was later used on many F6F-5N night fighters. All production F6F-5s had the ability to be fitted with the different armament configurations, but only F6F-5N night-fighters, equipped with radar, ever used the latter gun fit. Grumman F6F-3 Hellcat in late 1942 non-specular blue-grey over light-grey scheme. USS Yorktown (CV-10) during the Marcus Island raid on 31 August 1943: CAG-5 Lt. Cmdr. "Jimmy" Flatley in his F6F-3 Hellcat before takeoff. 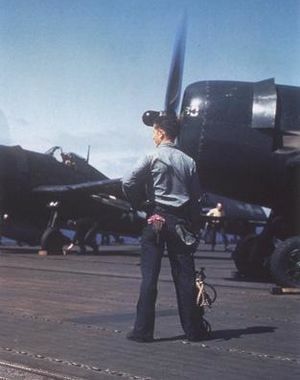 Aviation Boatswain Mate stands ready to remove chock from wheels. 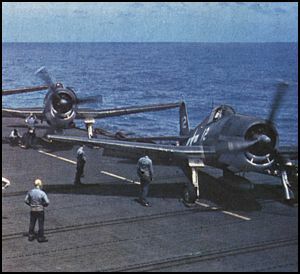 Grumman F6F-3 Hellcats on the flight deck with wings folded, Grumman Avenger on landing approach. The Hellcat first saw action against the Japanese on 1 September 1943 when fighters off the USS Independence (CVL-22) shot down a snooping seaplane. Soon after, on 23 November, Hellcats engaged Japanese aircraft over Tarawa, shooting down a claimed 30 Mitsubishi Zeros for the loss of one F6F. Over Rabaul, New Britain, on 11 November 1943, Hellcats were engaged in day-long fights with many Japanese aircraft including A6M Zeros, claiming more than 100 victories while losing few F6Fs. The "Thach Weave" had developed into a formation tactic by that time. Each time an enemy fighter made a run at a section of US fighters, the pursued Hellcats would break towards the opposing formation who would cross over and force the Japanese to break off or expose themselves to the Hellcat's weapons. Hellcats were involved in practically all engagements with Japanese air power from that point onward. Navy and Marine F6Fs flew 66,530 combat sorties (45% of all fighter sorties of the war, 62,386 sorties were flown from aircraft carriers) and destroyed 5,163 enemy aircraft (56% of all Naval/Marine air victories of the war) at a cost of 270 Hellcats (an overall kill-to-loss ratio of 19:1). The aircraft performed well against the best Japanese opponents with a 13:1 kill ratio against Mitsubishi A6M, 9.5:1 against Nakajima Ki-84, 28:0 against Kawanishi N1K-J, and 3.7:1 against Mitsubishi J2M during the last year of the war. In the ground attack role, Hellcats dropped 6,503 tons of bombs. The F6F became the prime ace-maker aircraft in the American inventory, with 306 Hellcat aces. It was the major U.S. Navy fighter type involved in the Battle of the Philippine Sea, where so many Japanese aircraft were shot down that Navy aircrews nicknamed the battle The Great Marianas Turkey Shoot. The F6F accounted for 75% of all aerial victories recorded by the U.S. Navy in the Pacific. Radar-equipped Hellcat night fighter squadrons appeared in early 1944. The British Fleet Air Arm received 1,263 F6Fs under the Lend-Lease Act and dubbed it Gannet. The name Hellcat was eventually retained for the sake of simplicity, with the F6F-3 being designated Hellcat F I, the F6F-5, the Hellcat F II and the F6F-5N, the Hellcat NF II. They saw action off Norway, in the Mediterranean, and in the Far East. Initially known as the "Gannet" in Fleet Arm Arm service, however, this name was discontinued in early 1943, and the Hellcat name used instead. FAA Hellcats were rapidly replaced by British aircraft after the end of the war. In British service, the Hellcats were proven to be a match even for the prime Luftwaffe fighters, the Bf-109 and Fw-190. Postwar, the Hellcat was succeded by the Grumman F8F Bearcat which eclipsed the F6F in performance but was developed too late to see combat in World War II. The Hellcat soldiered on in a number of second line USN duties including training. The French Aéronavale was equipped with F6F-5 Hellcats and used them in Indochina. The Uruguay Navy also used them until the early 1960s. Plane captains ready VF-82 Grumman F6F-5 for launch from USS Bennington (CV-20) off Okinawa in May 1945. Late-war production F6F-5 show the overall Glossy Sea Blue. 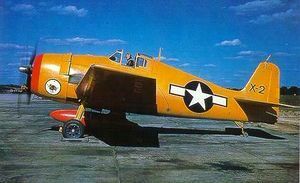 Postwar service: A bright orange F6F-3K target drone. ↑ Loftin, LK, Jr. Quest for performance: The evolution of modern aircraft. NASA SP-468. Access date: 22 April 2006. ↑ Jane, Fred T. “The Grumman Hellcat.” Jane’s Fighting Aircraft of World War II. London: Studio, 1946. ISBN 1-85170-493-0. p. 233-234. ↑ Standard Aircraft Characteristics: F6F-5 Hellcat. NAVAER 1335A. Kinzey, Bert. F6F Hellcat in detail and scale. Shrewsbury, UK: AirLife Publishing Ltd., 1987. ISBN 1-85310-603-8. Sullivan, Jim. F6F Hellcat in action. Carrollton, Texas: Squadron/Signal Publications, 1979. ISBN 0-89747-088-5. Taylor, John W. R. "Grumman F6F Hellcat." Combat Aircraft of the World from 1909 to the present. New York: G.P. Putnam's Sons, 1969. ISBN 0-425-03633-2. Tillman, Barrett. Hellcat: the F6F in World War II. Annapolis, MD: Naval Institute Press, 1979. ISBN 0-87021-265-6. Winchester, Jim. "Grumman F6F Hellcat." Aircraft of World War II. Rochester, UK: Grange Books plc, 2004. ISBN 1-84013-639-1. This page was last edited on 6 March 2007, at 07:21.